The Bank of Toronto, St. Catharines, Ont. 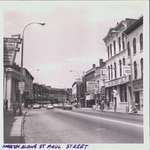 Queen Street, Looking North From St. Paul, St. Catharines, Ont. Queen Street, looking north from St. Paul. St. Catharines, Ont. A business card showing the head office of the Lincoln Trust and Savings Co., 4463 Queen Street, Niagara Falls, Ontario. 1972. 1972 calendar on the reverse. St. Paul Street, St. Catharines, Ontario, Canada.